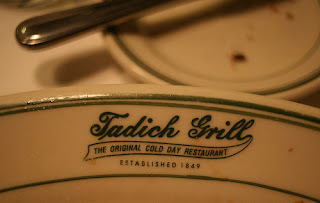 On Christmas Eve Eve, John and I headed into San Francisco to The Original Cold Day Restaurant, Tadich Grill. 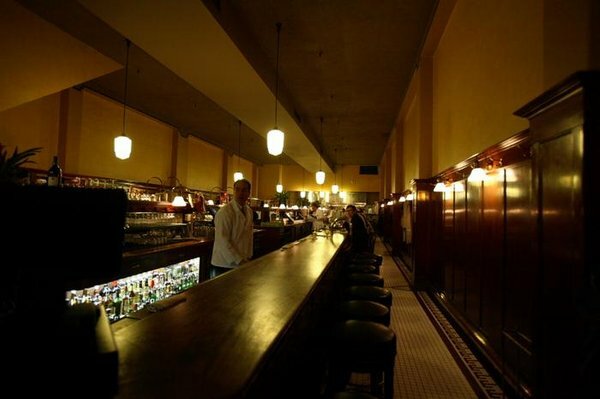 It also happens to be the oldest restaurant in San Francisco. 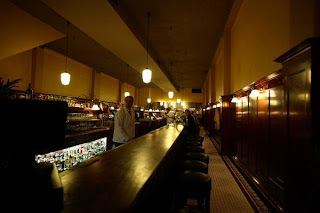 Established in 1849 on Clay Street, it was painstakingly relocated to its current location in the 1960’s. Moldings were recreated by local craftsman, original fixtures re-used, just about everything was done to make sure the look and feel of the original location was preserved. 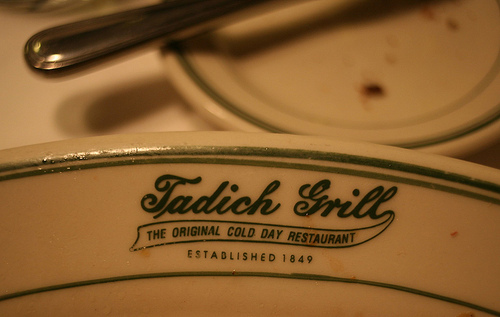 The first thing you notice when you enter Tadich is how completely ordinary it is. There is no flash, no daring art, and best of all no hyper tall hostess staring menacingly down at you. A simple eighty foot wood top bar (oiled with mineral oil twice a year and sanded every couple of years…yes, I asked. ), oak panelling, brass hooks for your coat, and simple art deco light fixtures. What you do notice is the service delivered by impecable waiters of a certain age in crisp white jackets and ties. We opted to sit at the bar versus wait for a table. We find the service to be equally good if not better than at a table, the atmosphere more casual and the people watching superior. Known for their seafood, John had Petrale sole but I choose as I always do when given the choice, steak. The menu is a classic. San Francisco treats like Crab Louie, Sand Dabs, Cioppino, and Hangtown Fry are regular features. A large wedge of fresh sourdough bread accompanied the meal. Topping the meal was a spot on custard with a single espresso. My attention however, I have to admit kept being drawn to the details in the room. The overwhelming sense of history, the leather stools, the oak panelling, the brass fixtures and the tile work, it was all perfect. At one point looking out towards the street from our perch at the bar, one of the older electric city buses from the 40’s puttered by and looking through the glass window, the neon sign, and the waiters, you would have sworn that you had been transported back in time. There is an authenticity about certain places that is tangible. Classic, simple and in good taste. Being in some trendy restaurant with the all too often overdone dining room and underdone menu seems so irrelevant when you know you can have this. I love projects like this. It is design at its best. A question is posed by a client, a concept is developed, and installed. The freedom to create without limits or hesitations. As one of the participating designers I had the good fortune to work with artist Joe Davidson (http://www.joedavidson.com/). 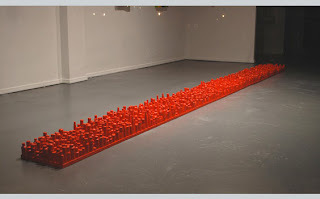 I was not familiar with his work and was incredibly inspired and moved by his talent. 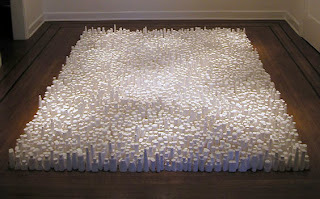 The common thread I found in his work was a great depth in the simplicity and silence of his message. 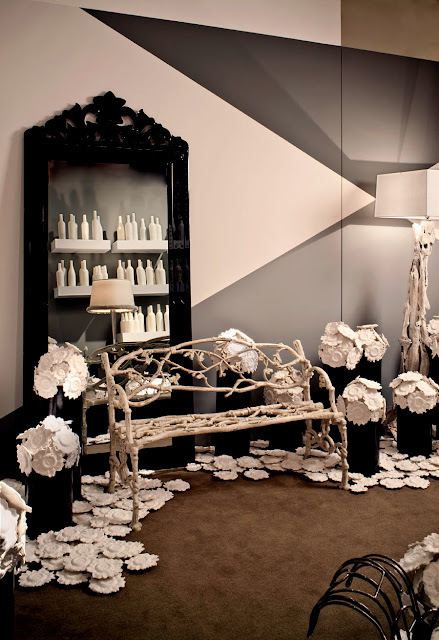 A stoic elegance evocative of a modern world and a yearning for nature. His installations sometimes look like cityscapes but could just as easily be a coral reef. After meeting several times to get to know each other better and understand our individual points of view, we agreed upon a study of light and dark. We decided to call it Shadow Garden. The exploration of what happens in the interplay of the spaces that are not spaces. 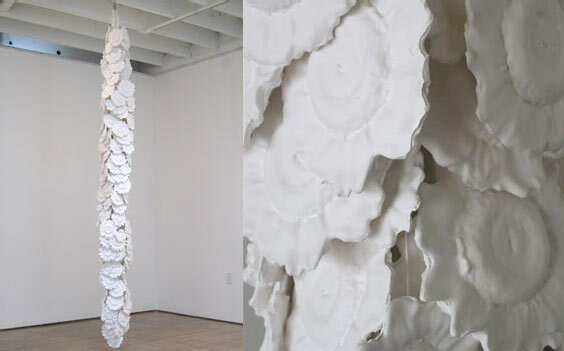 His gentle spirit as an artist made the entire process possible as we created a space that brought his work to life in a way that had not been installed before. We also installed his Scotch tape bottles which are skeletons of actual bottles of various libations. They are as haunting as they are beautiful. 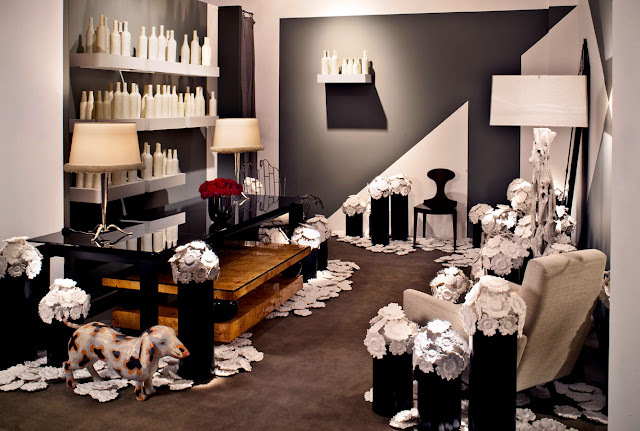 My contribution was to introduce a palette and furnishings with a whimsical touch but not loosing the serious nature of Joe’s work and wanting the art to speak volumes while the furnishings anchor the space but receed at the same time. Lighting played a huge role to guide the guests through the space and gently lead the eye. A Ruhlman-inspired burlwood coffee table, a driftwood lamp, a danish chair, a black glass table all added to the eclectic message. Below are the results. Can you tell which shadows are real and which are painted? In design you make decisions guided only by your inner compass and your eye. It is only when the work is done that the design will reveal itself to you, slowly and if you are lucky enough, ever changing. Hopefully our point of view was clear. So remember to be daring in your decisions, confident in your eye and most important of all be true to yourself. Thank you Joe I look foward to our paths crossing again.